Both our Advanced and Premier levels feature attractive design elements with beautiful color schemes. The majority of practices can find just what they need at the Advanced level, but for those that want extra customization—for instance, a 1950's Hollywood feel that matches the office decor—the Premier level is the way to go. Take a look to see which level might be the one for you! Each of our 7 designs has 6 color choices and almost unlimited layout options. If you like a certain design, but are wondering if something is customizable, it's most likely possible, just ask! And the process is quick! Contact one of our friendly team members to get started. Have a specific look in mind? Maybe one that matches a Parisian cafe, Spanish villa, or Arts & Crafts era detailing of your office? We'll work with you to provide a seamless look between your practice location and your website. We spend time with you, discussing goals and expectations. After perusing our site and contacting us, you'll be connected with one of our friendly and knowledgeable account representatives. He/She will spend time discussing some of your overall goals, expectations, and of course your budgetary concerns. It's so easy and painless! After taking down this information and getting a good idea of what solution will suit your practice best to begin with, the account rep will assign you to a dedicated project manager who will call you back at a convenient time to get into nitty gritty details of the design. Advanced or Premier, we'll help choose the best fit for you. You might already know what you want by the time you've signed on with us—as far as whether you're interested in going with an Advanced or Premier design, but if not, don't worry—your dedicated project manager is there to help. "What should be on the homepage?" "Can we link to our office forms?" "Do I want a video slideshow or a static image?" Your project manager will talk things through with you, make sure we have the essentials in place, and communicate your needs to the design team. 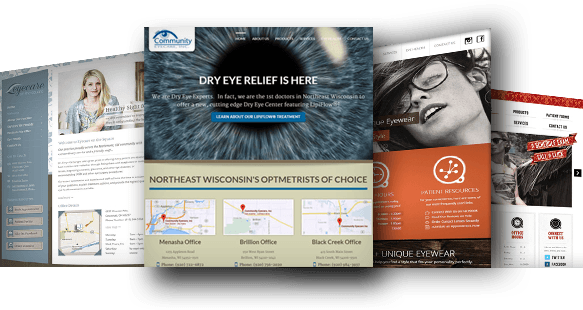 We then have 80+ pages of standard text, covering eye health and diseases, products, and services, that you may customize prior to the site going live. You'll be able to easily customize and add to this text as much as you like afterwards as well. Confirm your monthly subscription & maintenance package. Now is the time to finalize this detail. The package you choose can affect the design details of the website. Unlike some other companies, we don't have a lot of confusing packages—we have 4 straightforward levels. In addition to many features and unseen backend monthly maintenance duties, we include a solid level of on-site Search Engine Optimization (SEO) on each website. Rest assured, we don't build a sophisticated website and then expect you to pay us extra to make it attractive to Google and other search engines. And unless you are in a large or otherwise difficult market, there's usually little reason to start off paying someone hundreds or thousands of dollars per month for SEO. This is the magical part. We work hard to bring your ideas to life. With your information in hand, your designer will begin the development process by creating a wireframe of your home page for you to sign off on. This "blueprint" shows the relative size and placement of the page's features, and is a great tool to make sure that everyone is comfortable with content and placement. If you chose a Premier design, your site's designer will also create a full-color mockup before building the site. One detail that website do-it-yourselfers often don't think of is the cost of high-quality photos necessary to make a site eye-catching. Good stock photos can easily range from $20-$100 per image. That adds up quickly! This is where an agency like EyeMotion can save you quite a bit of money. Our designers have access to vast stock photo libraries, and we don't charge extra for stock images included in your web design! Peace of mind. We're known for our dedication to customer service. Because our sites are built using Joomla!, a popular, easy-to-use, content management system (CMS), you'll be able to readily make most text and picture changes as often as you need. An optional blog is included with each website, so you'll be able to quickly update your site with holiday hours, trunk shows, before-and-after-new-glasses photos, and more. Your project manager will be able to train you in under an hour—even if you have no prior web experience! But you're not just on your own. Your EyeMotion subscription package also includes maintenance and support. We'll keep your site's CMS up-to-date, protected from hackers, and fully backed up as an extra precaution. We're also here if you have questions or concerns or need someone to set up a new office email address or upload your new .pdf office form.